Gilbert the Englishman (Gilbertus Anglicus) was an early 13th-century physician, about whom little is known. He perhaps studied at the famous medical school at Salerno, in southern Italy. Several other texts are added to Gilbert's compendium in this manuscript: a donation inscription tells us that the compilation was made by Brother John of Greenborough, who was for more than 30 years the 'infirmarius' of St. Mary's Abbey, Coventry. This is the first page of Gilbert's text. 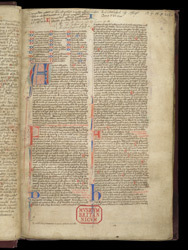 At the top of the left column is a short list of the chapters, followed by a red and blue initial 'A' introducing the first chapter. The text as originally written did not include an indication of its author, so 15th-century and later hands have added notes concerning the authorship in the upper margin.